It’s time to start collecting chocolate in the Kinzville Park. 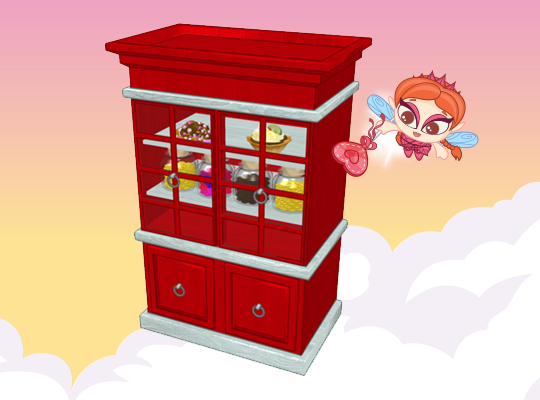 This year’s Grand Prize is The Sweetheart Pantry Fridge. It is the perfect place to store your chocolates. and it can be yours if you collect all 6 chocolates from February 7th – 14th. Five chocolates can be collected from Cinnamon’s Chocolate Stand in the park but 1 is only available from Webkinz Newz. From February 7th – 14th, look for the floating Jumbleberry Jam Chocolate on WebkinzNewz.com and click on it to send it back to your Webkinz account and have it added to your collection. Thanks for post this dixiecup! Hopefully it holds more than 6 chocolates. i was coming here earlier to post that vanity but ya beat me to it moms! duh! switched to car and ta da! was driving me slightly nutso as i know it does not take 80 hours to get to X! but i guess if you are walking…………. 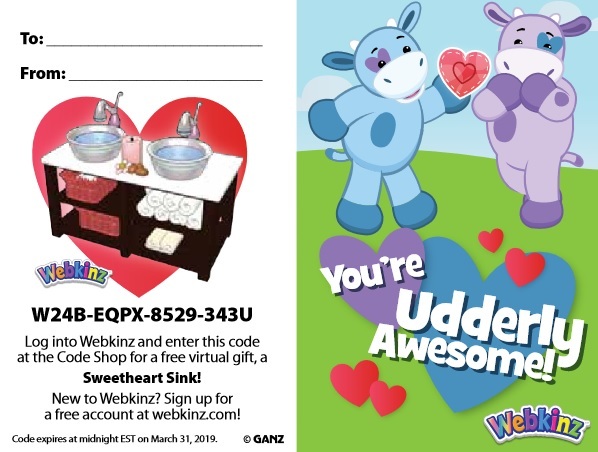 Came here to post the sweetheart sink code, but Moms beat me to it! I love all the valentine day themed items -soo cute! Dee – LOL! That’ll do it! Dee – I’ve done that before – had Maps on “Walk”! LOL! I’m all “webkinzed” out for the day! Tried to do too many pets in the Kinzville Academy for Super School Day. But good news! I finally finished grooming & cooking for the first time ever! Woo Hoo! Still attempting strength. Almost passed on level 8 after six months of trying (by one rep) since the glitch. Bummed…So close! I really need another glitch to happen to be able to complete strength. I almost need to make a checklist of all that has to be done in one day. Hey, guys! Been a while since I’ve been on here. I’ve been trying to visit Sophie every day, but I missed a couple days. I only need the plush. For the cupcakes, I’m only missing 2 Friends cupcakes to complete my collection so I’m hoping I’ll get those before that stops. I only need the Strawberry Apple and Orange Blast Friends cupcakes. Fingers crossed I’ll get them. Collecting Cinnamon’s chocolates is going to be a piece of cake. I already got all of the Webkinz Newz chocolates I need. ad which reads…. Sophie’s Rewards… Purple box… some of balloon items shown on Lurker’s sneak peaks…..
moms… I forwarded the newsletter from estore and wondered if you could share the picture or provide the link so everyone can see what I have been talking about…. I don’t believe I’ve heard that song of Lorettas, but yes dee I agree that could be classified as a helper!! The difference between Prozac type meds, and ones like v alium, and x anax, are you take Prozac daily and it builds up in your system, the others you can take as needed, which is good because they are addictive. I’ve had effexor in past, and it helped me through a very dark time. But I was able to sl I wly come off thst after a year. Now the x anax, it is perfect for me. As I don’t need a daily med. And I use it for high stress situations, like funerals. I have panic attacks. And this allows me to stay calm. Its a mild tranquilizer. Yet it doesn’t cloud my head. Not like some other meds can do. Unless of c I use you abuse it. I’ve never tried v alium. Not positive but I think that it may be more addictive then the X anax, and not perscribed that much these days because of that. Oh my, that sink sure is cute! I went in after 12 to do candy colection and gave uo, it kept throwing me off ww!!! So I’m about to go in and try again. I did PAN ..not one new item out of 7 accounts. Figures. So I’m glad to see the gem tiles in pan still and on wheels! Hope to get more! I love the gem stuff.! Re #5, oh dee that’s hilarious! dee, thanks for the heads up on rhapsody! Can’t wait to see it! Hubby and I saw that movie in the theater! We both lived it. Hope you enjoy it! i’m not feeling any type of way??? i don’t think??? what did i miss??? dee.. hope you have a nice road trip ! Queen of Sheeba… Good luck with the Academy Strength…Have been trying for years to complete that and the running class.. Seems impossible ! I misunderstood something, it’s all good. I mixed up another post I was looking at because I was in a hurry, no worries. Gaga – I have a bit of trouble with strength, too, but somehow I have completed that one for two of my pets. Working on pet 3 for speed. I have zero for strength. On my dd’s account we are 21 classes away, and on my account I am on level 8. Only reached those levels due to the glitch last year. I worked on strength almost every day this summer, but finally decided that I was wasting classes. Now, I am “forced” to work on it with one pet because I only have three classes left. I was able to “almost” do it yesterday, with only 1 rep left. I did it again with deluxe class and had 6 reps left. Usually, my average is 10 reps left. I am skeptically hopeful. LOL! Gaga – I have a bit of trouble with SPEED, too, but somehow I have completed that one for two of my pets. Meant to say speed, not strength. Ha ha! I just realized that I have eighty-three classes to go to finish strength. When I look at it that way it seems impossible(instead of by levels). My luck of almost finishing one class yesterday was not with me today. I had 13 reps left and on the extra class 11 reps left. Yesterday I had tried the trick of having a bunch of things open, but that trick did not work today. There’s a different browser, Blue Stacks? I think it was. Slows things down enough that you can accomplish the Agility and Strength tests, I imagine it might also work for speed. Mist, the trophy isn’t that hard to win if you play WW on Bluestacks. The game moves verrrrrry slowwwwwly, so it’s a snap to get the trophy. I’ve won the trophy on four different accounts, but stopped because it takes soooo loooong and is sooooo borrrrring to play the verrrry slowwww game. If you are truly desperate, let me know and I will go win another one for your friend. Nothing needed in return! hello gaga! happy Friday! hope you have a great weekend!!! dee – hope your birthday tomorrow is as wonderful as you!!! QoS – thanks for the checklist of what we need to do on comment 8! i am working chocolates on multi accts and in doing all of them, i forget to do the valentines……….so i have a mishmash of valentine levels! any body have a pulled pork crockpot recipe? i was thinking just some chicken broth, garlic, onions and peppers and a splash of liquid smoke????? Dee – I don’t have ads on and cinnamon is showing up fine for me. dealing with dds school stuff………..just planning……i suggested she do an extra year just to keep her on our insurance and she shot me down! Can’t you keep her on it until she’s 26? I know she’s younger than me, so she’s still got a few years until she’s there. I’ve still got a year and a half on my parents plan. By then I’ll be in grad school and can get a policy through the school, but I’m stressing about it. My parents have good insurance so I’m trying to get things taken care of now. Just scheduled a dentist appointment because my gums a receding, possible treatment is a gum graft, aka $$$, so if that’s necessary I need it done before I’m booted off the plan. It’s probably not serious enough to need that, but I’m paranoid so. HAPPY BIRTHDAY DEE !!!! Hope you have a great road trip and luncheon !! Sounds like you will be celebrating your special day with some fun things to do! Maybe you will find a hard to find treasure for yourself along the way ! Your wish list is always empty… There must be virtual item that you would love to add you your collection !! Any ideas ?? Enjoy your day ! My mom is really slowing down… so daily visits take up extra time and energy for me…. having a little trouble keeping up with WW and news on Gymbos.. Think of all of you … and hope your daily struggles and RL problems are improving…. Have a good day .. Stay warm… stay safe and have some fun! gaga – i’m sorry to see that about your mom – let us know what we can do to help you with WW & to support you! HAPPY BIRTHDAY DEE! Hope you have an awesome day with your dh! gaga—hugs and prayers for you and your mom. I know what it’s like and how much it energy it takes. Take care of yourself and please do let us know if we can help with any WW stuff. Dixie—Sorry we sent the Polar Kotex your way…it was no fun. Glad you are out of the deep freeze. Funny how the 0 temps we’ve had the past few nights are no big deal now. Some of my accts. have valentines, some have the mayor and chocolates, some have the cupcakes…it is tough to keep it all straight! My valentine levels are all over the place too. I forget at least one thing on each acct. Been too busy with work, Stella and dh had big work meetings, which are finally over and he can pitch in now with Stella. He took her to puppy class this morning so I could get some things done around the house. I got a load of laundry in and then promptly came here! hahaha Priorities! On to WW! Hope all have a great day! April, we are by no means out of the polar vortex, it is set to last yet another week. It is -34 as we speak, mid afternoon. I am so sick of the cold, already. Dee, hope your have a tremendously Happy Birthday. Gaga, I am calling my Mom tonight, she is also immersed in a polar vortex and her house is not well equipped to handle this. It’s bad enough when they slow down, but worse when they are too stubborn to move. I know she loves her little house, but it’s scary this far away and I can’t do anything for her. Thankfully I have a younger brother nearer to her who checks in on her. Dee – I know what you mean about different levels on valentines! Oh, and I don’t have any recipes for you! Sorry! I read on some Webkinz fan site that old codes will not work after maintenance. Does anyone have more specifics on this? Meanwhile, I’ve asked the question on that site. I didn’t know if it was specifically codes that you enter in code shop or items in doc that award prizes when you put in room or feed to pet. Dixie- Never heard of Bluestacks before. I did open loads of youtube videos the day that I did my best on strength (level 8) but still failed by one rep. The next day I did the same thing. But I was back to failing with 10-12 reps left. So I just don’t know! Continually frustrated with this. Looks like Sophie is gone in the park, so I can scratch that off my list! Yay! Okay – I found out that the answer to the old code question is concerning e-store codes that are over 3 years old – they might not work. But if you show proof of purchase, GANZ corrects issue with you. Whew! Good to know, although I probably have some codes given to me that I haven’t entered OR codes bought. Not sure. And it isn’t related at all to maintenance next Wednesday. Sorry if I alarmed anyone! I certainly was alarmed. I plan to read up soon, but for now just wanted to say …. Wait! I missed a birthday! Happy Birthday, Dee! Hope it is special! Woo hoo! Also, my list isn’t comprehensive. I’m still trying to collect a few charms in the magical forest. I have 3 or 4 more to go in Fairy Falls and six more to go in Magic Mire. When I have extra time I go on vacation and/or do a job. I’m sure there is more, but the list I posted in post 8 is what I’m focusing on now. Dee – you can still keep your dd on your insurance up through age 26. She doesn’t need to be in college. I just put my leftover roast beef dinner in crockpot for a stew. and insurance advice……….we can do tricare young adult for a bit of money per month with waaaaaaaaaaaay less providers………..so not sure if it is even worth it to pay 300 bucks a month just in case…………. Happy Saturday, All! We spent the day hanging around watching Jose the Drywall Dude mud and sheetrock the new drywall. Drywall is a fine art, and Jose is an ARTIST. It looks SO GOOD. He'll be back on Monday to paint! Then we took Kiddo out to dinner (Chuy's- Tex-Mex. YUM! ), and to PetsMart to get the first round of cat supplies- we're for sure getting him a kitty for his birthday! He doesn't know yet, but I hope he'll be excited when we take him to the shelter in April to find a furry friend! Happy Birthday Dee!!!!! I hope that you have a fun one! So happy it is Sunday… Looking forward to our family gathering.. serving a strip roast today and mashed potatoes.green bean casserole..corn on the cob and for dessert …. chocolate mousse…( our of a box..but soooo delicious !! Academic Challenge and an all around great kid ! He was devastated.. as we all were but have not given up hope that he will be accepted when general applications are reviewed…. dee.. sorry your road trip postponed.. hope your dh is feeling better today..
April and moms.. thanks for offering to help with WW items.. I am sure at some point I can get what I need… just need a little more time to PLAY !! My mom is heading for 93 in May… and is very adamant about staying in her own home….” We ” (5 siblings) promised my Dad that “We” would take care of my Mom……………………but there is NO “We”…so I guess I just needed a little pity party yesterday….. sorry.. but better today..
cwc .. sorry you are feeling so sick… but hopefully today things will be better.Sending a ((HUG)) your way ! Puma.. happy to read that your dry wall project is going so well ! Jose sounds like a real gem !! Hey gramma… Hope you are doing well… Spring is right around the corner! Dixiecup… sorry your mom lives so far from you ! That would be very worrisome but I am sure your brother is happy to help…Elderly sure can be stubborn about maintaining their independence…. Hope you all enjoy your Sunday !